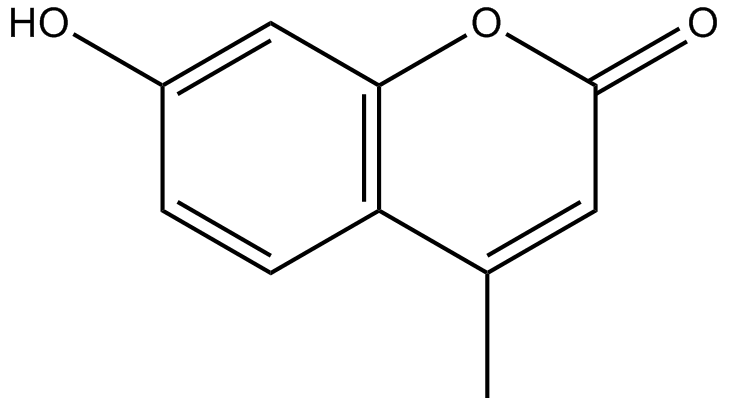 4-Methylumbelliferone is a hyaluronic acid (HA) synthesis inhibitor. The activation of HAS2 and the over-production of HA are existed in many metastatic tumor cell lines. Increased synthesis of HA is often associated with increased metastatic potential and invasivity in tumor cells. In vitro: 4-Methylumbelliferone (MU), an inhibitor of HA synthesis, has been studied as a potential anti-tumor drug on account of inhibiting the growth of primary tumors and distant metastasis of tumor cells. The mechanism still needs to be clarified, although several studies revealed that the anticancer effects of MU are mediated by inhibition of HA signal pathway. In a previous study the regulation of HA synthesis was demonstrated by ceramide, and now show how MU activated NSMase2 generates ceramides and mediates MU modulated inhibition of HA synthesis (cell migration and invasion, and apoptosis of tumor cells). Using a HA enriched mouse oligodendroglioma cell line G26-24, it was found that MU elevated the activity of NSMase2 and enhanced ceramide levels, which in turn potentiated phosphatase PP2A activity. Further, the activated PP2A decreased phosphorylation of Akt, reduced activities of HA synthase2 (HAS2) and calpains, and blocked both the synthesis of HA, and the migration and invasion of G26-24 tumor cells. In addition, MU mediated ceramide induced activation of p53 and caspase-3, decreased SIRT1 expression and deduced G26-24 viability. The mechanism of the MU anticancer therefore initially involves NSMase2/ceramide/PP2A/AKT/HAS2/caspase-3/p53/SIRT1 and the calpain signaling pathway, indicating that ceramides play a important role in the ability of a tumor to become aggressively metastatic and grow .